Disc Type Self Cleaning Filter is used for highly viscous material filtration like Grease, Lube Oil, Edible Oil, Toothpaste & many more. Here, we don’t required any backwashing media to clean the Filter Element. It is working under principle of differential pressure parameters for uninterrupted filtration requirement. Disc type self-cleaning filter is constructed of filter housings, filter elements, and drain valve. It also has a pneumatic cylinder and timer-based drain valve. Filter housings can be offered in various materials of construction such as various grades of stainless steel, carbon steel and alloy metal. Filter elements can be offered with wedge wire, sintered multi-layer wire mesh, plain wire mesh and sintered metal powder configuration. They are selected based on the requirement of filtration quality. No replacement costs for filter screen and no disposal expenses. Disc type clean permanent cartridge. Reduces the risk of operators in contact with the dangerous material. Reduces the labor demands and no more filter screen changeouts. Increases profitability, improves overall system efficiency, and reduces downtime. Longer life, higher accuracy, higher erosion resistance. Space-saving design, small and compact footprint. 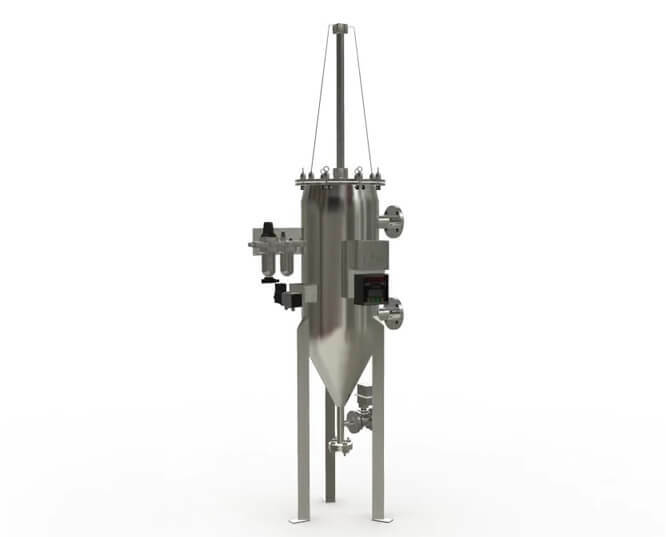 Collection and removal of contaminant from fluid being filtered, without any interruption in the operation.